My D4 team, The Jokers, were gutted this season. We lost 4 of our top players after they were forced to move up a division, leaving us to re-rack with new players that are still learning and developing their hockey skills. We've only managed one win after 6 games and for the most part we've been outmatched and not very competitive. In the locker room last night, spirits weren't particularly high before the game so I did my best to get the Jokers fired up. In mock fashion I demanded everyone work to get me my first shutout of the season. I saw smiles and faces relax as we headed to the ice. Maybe even some belief. The game began and I was focused and fresh despite playing an game earlier that night- demanding my old body to rise to the challenge. After handling a couple of routine shots, the score was 0-0 three minutes in the first period when an opposing winger dumped the puck softly into our zone as they went for a change. I saw my defenseman heading behind the net to pick up the puck when I heard him shout, "Watch it!". There were no opposing players in our zone and nobody but my own defense skating inside our blue line. The whistle blew. Opposing players at center ice whooped, "GOAL!" I stood there dumbfounded as the referee skated over and said, "I've only ever seen that one other time". The puck had skittered along the corner boards and found something akin to a worm hole that took the puck on a mind-blowing angle towards my post. The puck had glanced off my right skate blade and into the net. All while I stood looking towards center ice. So much for the shutout. We ended up losing 5-1 with a couple of garbage goals late. Our team was outmatched and not very competitive. We played on our side of center for three quarters of the game but I wonder had that first goal not broken the laws of physics and put them up 1-0 whether the game would have played out differently. I give credit to my Jokers who worked hard through the third period but sometimes you have to laugh or cry when the hockey gods don't smile on you. 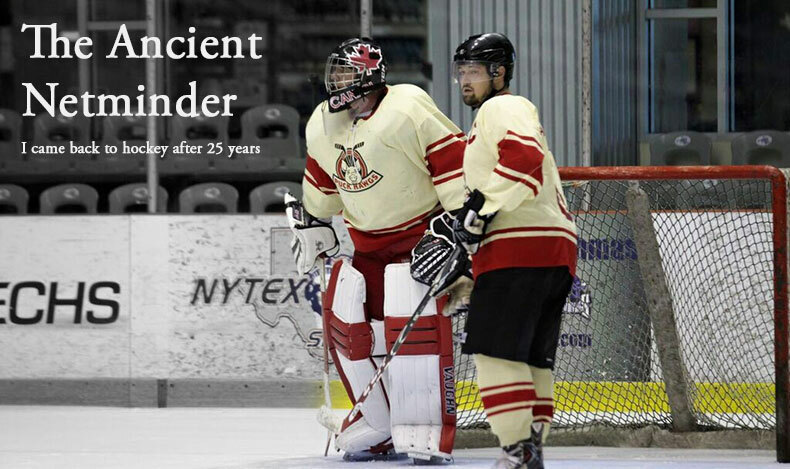 Last night we all smiled because this is beer league hockey and I'm an Ancient Netminder.